Vietnam, a long, sinuous country on the eastern coast of the Indochina Peninsula borders the South China Sea to the south and east, China to the north, and Cambodia and Laos to the west. From Hanoi’s French Quarter, Halong Bay’s towering limestone islands, Nha Trang’s white sand beaches, to the Mekong Delta’s floating markets, Vietnam is both unified and diverse. In addition to the Viet ethnic group, Vietnam is home to 54 ethnic minorities including the Hmong, Dao, Tay, Thai, and Nung, many of whom live in the northern highlands. Vietnamese culture focuses on humanity and harmony—except for the dizzying traffic in Ho Chi Minh City. A unique blend of East and West—a touch of Parisian charm lingers in the city’s tree lined boulevards, green parks, and shining lakes. 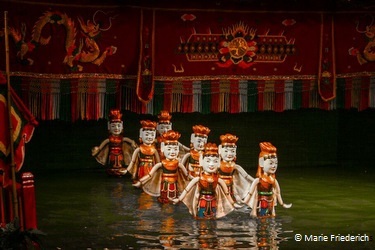 Wander the Old Quarter where ancient temples mingle with colonial architecture, take in a traditional water puppet show, or explore Jade Island in Hoan Kiem Lake. Ho Chi Minh’s Mausoleum and Museum and the Hoa Lo Prison (the Hanoi Hilton), offer a glimpse into 20th Century Vietnam’s struggle against imperialism. Halong Bay, where the dragons descend to the sea, is not to be missed. Cruise through a mystical seascape where more than 2000 jungle-covered limestone islands (karsts) rise from the emerald waters of the Gulf of Tonkin. Halong Bay is a UNESCO World Heritage Site. Sapa is a quiet market town in the northwestern highlands close to the Chinese border. Cascading rice terraces cover the hillsides of the Muong Hao River valley and Fansi Pan, Indochina’s highest peak, looms in the distance. Hmong, Tay, and Dao hill tribes live in the area and sell their colorful traditional clothing and crafts at the local markets. Trek the rolling hills between small rural villages to experience the daily life and vibrant culture of the hill tribes. Picturesque Hoi An was an important trading port in the 17th and 18th centuries. Its beguiling mix of European and Asian influences make it an ideal place to explore. The winding canals and streets of the Old Town, a UNESCO World Heritage Site, are lined with centuries old merchant houses, temples, and tea warehouses. End the day window shopping along Old Town’s atmospheric lantern-lit streets. The Imperial capital of Vietnam until 1945, Hue is often called the most beautiful city in Vietnam. Stroll the promenade along the Perfume River or explore the remains of the Citadel. The seven story Thien Mu Pagoda, the tallest pagoda in Vietnam, was built in 1601. Pine-covered hills, pristine lakes, and rolling farmland surround Da Lat, a a colonial hill station in the central highlands. Founded by the French as a vacation retreat, Da Lat retains much of its colonial architectural heritage. Bai Dai, Vietnam’s last emperor, had his art-deco style summer palace here. Year-round temperate weather and fertile soil make the surrounding valleys perfect for growing orchids, roses, fruit, and vegetables. A lively and urban seaside resort town, Nha Trang is the gateway to some of the best beaches in Vietnam. With its white sand beaches and clear blue sea, it is also Vietnam’s scuba diving center. Take a break from the beach and visit Long Son Pagoda, with its 79 foot-tall white Buddha, or wallow in the mud baths of the Thap Ba natural hot springs. To escape to a less urban setting, visit the nearby beaches at Doc Let and Bai Dai or the lakes at Ba Ho. Also known as Saigon, Ho Chi Minh City (HCMC) is the commerce and cultural center of Vietnam. Much of life in HCMC takes place in the streets, and the city pulses with energy. 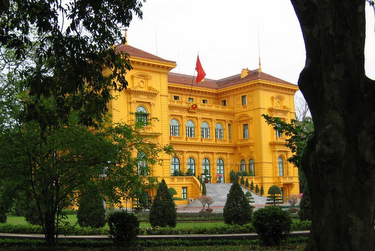 Vietnam’s history and struggle for independence can be explored at the War Remnants Museum (parts not for the faint of heart), the Ho Chi Minh City Museum, and the Reunification Palace. Shop at the lively Ben Thanh Market before visiting the incense-clouded Jade Emperor Pagoda. First built in the 1940s during the Indochina conflict, and expanded during the Vietnam War in the 1960s, the Cu Chi Tunnels were functioning underground cities. Over 125 mi long at one time, the tunnels included hospitals, schools, kitchens and sleeping quarters. Tour a portion of the remaining tunnels for a historic glimpse of life underground. The largest city on the Mekong Delta is famous for its busy wholesale floating markets. Travel by sampan through the organized chaos of boats loaded with fruit and other local products. Get there early as the markets open before dawn. An upright pole at the bow of each boat displays a sample of the goods for sale. Return via narrow rural canals lined with orchards and rice fields. Life on the Mekong Delta is measured by the rhythm of the Mekong River and its labyrinth of streams and canals. The intensely farmed delta, the rice bowl of Vietnam, is best experienced by boat. Travel through rivers and secluded waterways lined with stilt houses, mangrove forests, fish farms, and water buffalo working the rice fields. Surrounded by the turquoise waters of the Gulf of Thailand, easy-going Phu Quoc is a largely undeveloped tropical paradise and home to some of the most beautiful beaches in Vietnam. Its coral reefs teeming with tropical fish are a must for snorkelers and divers. The mountainous center of the island is covered by dense tropical forests. With Seam Reap as a base, explore the ancient Cambodian temples, palaces, and monuments in Angkor Archaeological Park. Angkor Wat, the largest religious monument in the world is the crown jewel of Khmer architecture and art. Other sites worth visiting include Bayon, its towers covered with gigantic smiling faces, Ta Prohm, with massive trees growing out of and around the ruins, and Banteay Srie, its red sandstone surfaces covered with intricate carving. One of the forgotten gems of Southeast Asia—Laos is culturally diverse and retains a bit of French influence from its colonial days. Laos and its people are friendly and relaxed. Colorful Luang Prabang, the ancient mountain capital of Laos, is a mix of Buddhist temples and colonial style shops and mansions. Wander the streets at dawn as saffron-robed monks collect alms. As the sun sets, stroll through the handicraft night market. The city is a UNESCO World Heritage site. Let us create a custom trip for you! Vietnam has three distinct climate zones with two monsoon seasons— October to April in the northeast and May to September in the southwest. The entire country is tropical or sub- tropical and the best time to visit depends on your destination. If you want to cover the whole country, autumn (October through December) and spring (February through April) are the best times to travel. March and April have the lowest rainfall across all regions and it is when temperatures are most pleasant. Summer is hot and humid everywhere and destinations can be crowded due to high domestic travel.